Squats were always few in their numbers and what their lacked in numbers they made up with technology. Squat warbands never go to war without full arsenal of high-tech weapons of destructions. Technology however, no matter how well made, demands constant maintenance and this is where Squat Tech-Smiths step in. 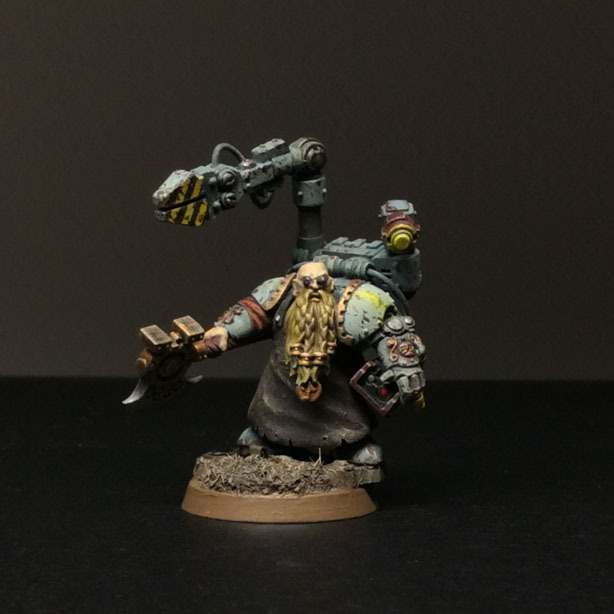 Tech-Smith is a Squat, who has completely dedicated himself to the lore of tech. In battle, they repair thrashed vehicles of even provide fire support with their deadly heavy weapons. 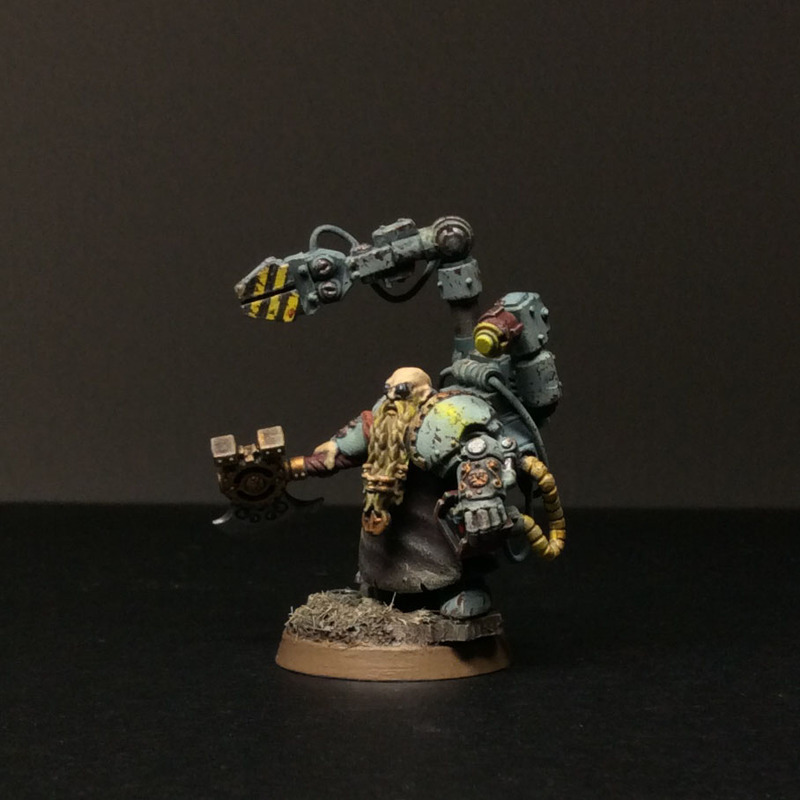 Tech-Smith is a revered member of the Squat community and no Warlord goes to battle without one! Really nice looking conversion and paint job. 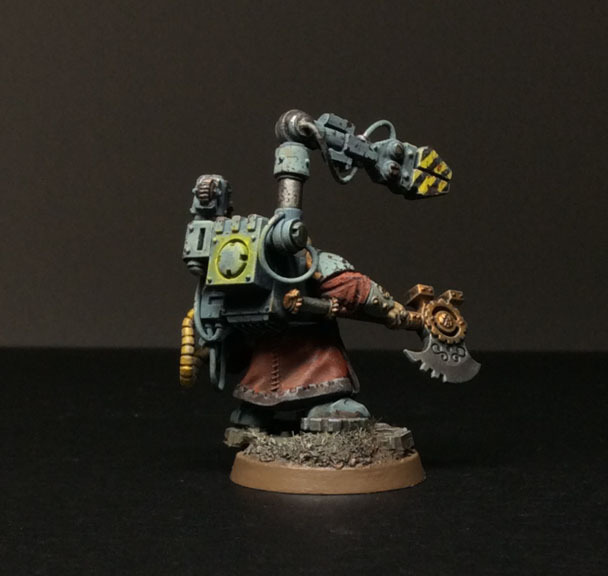 His servo-harness is topnotch, looking both battle-worthy and functional for his smithing duties. I also love his head, the little goggles are perfect! The only thing that looks a little strange to me is how he is positioned on his base. He looks really off-centered (potentially to prevent his ax from sticking off the base too much?). You could consider putting him on a larger base. This would allow you to center him easier and would prevent anything from sticking too far outside his base. You might be right about this Adam! Maybe I could put him on a 32mm & see how that would help. 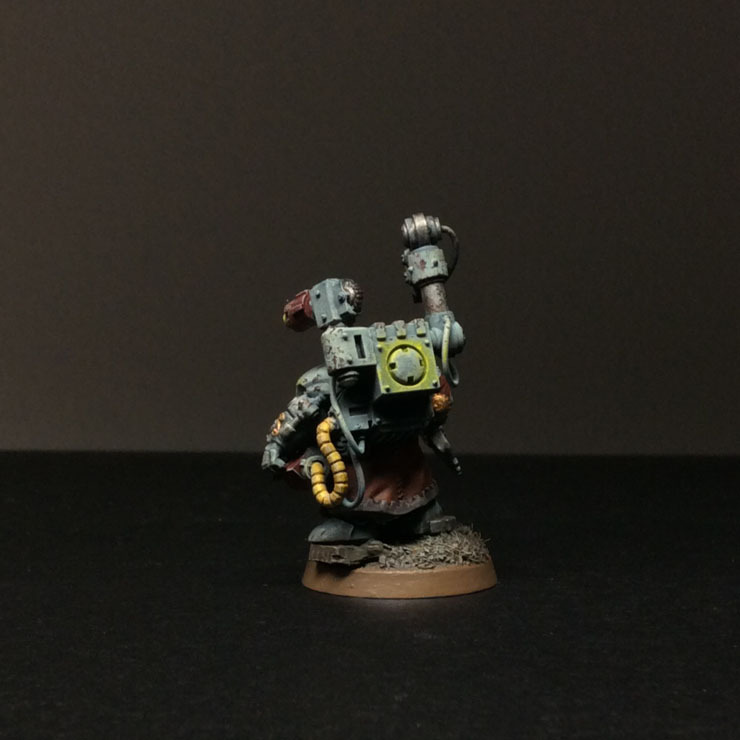 Adam’s got a point – 30 mm base would be perfect for this guy. Apart from that he’s top notch – especially the servo arm/ backpack. The goggles make him look like a character from my childhoods Starzinger anime. Fittingly that was a short scientist (a mad evil scientist but there you go). Ooh! I loved Starzinger too as a child!!! Unfortunately can’t recal that evil scientist tho:( Only scientist that I remember was the one who sent princes Aurora & friends to that planet! Yeah – Starzinger was awesome. I was thinking of the mad scientist who created the robot devil-bird. Don’t remember his name but I think he was an old buddy of the professor. The whole show is incidentally based on the classic chinese legend Journey to the West. Cogo is Hanuman, Hakka the pig and so on. He’s almost austere, like a monk. Simple attire but strong persona. I’m also a huge fan of the goggles. Lifts the overall piece by a fair margin. Awesome! Can’t wait to see the rest of the army.